When you look in the mirror, do you see a beautiful smile you’re proud to share, or do you see chips, cracks, and stains you want to hide? Don’t let a flawed smile prevent you from feeling 100% confident during every professional or social interaction. At Columbia Healthy Smiles, we offer patients a wide range of cosmetic dentistry services to meet any need. Porcelain veneers are one of the most popular treatment options. These thin sheaths of dental grade porcelain can be affixed to the front facing surfaces of teeth to create a flawless smile with just one, simple treatment. If you’d like to find out more about the porcelain veneers process, call our Columbia cosmetic dentist and team to schedule an appointment today. What is the Porcelain Veneers Process Like? Patients who choose porcelain veneers will need to visit Columbia Healthy Smiles for two treatment appointments. During the first visit, we numb the area around the teeth. Then, we remove a tiny amount of surface enamel. This allows the porcelain veneers to lay flat on top of teeth, blending flawlessly into the natural smile line. A series of bite impressions are captured, and we uses these impressions to design your custom veneer. Diagnostic x-rays, bite impressions, and our designs are all sent to a trusted dental lab where your porcelain veneers will be crafted. 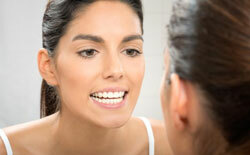 To protect the prepared teeth, temporary veneers are placed. You’ll return for the second appointment after we receive the custom restoration from our lab. As long as you’re happy with the look and feel of your veneer, this second visit is very short. In rare cases, we’ll need to make adjustments to the design and send the veneer back to the lab. However, most patients leave following their second appointment with a flawless smile. How Do I Care for My Porcelain Veneers? For the most part, you’ll continue to care for your teeth in the same way. You’ll need to brush teeth twice a day, floss daily, and visit our office at least twice each year. We do recommend choosing an extra soft toothbrush and non-abrasive toothpaste. This ensures the longevity of your veneer. One benefit patients with veneers can look forward to is that the high quality porcelain is stain resistant, so you’ll have a flawless, bright smile for years.